Where a gentle way is used in making Butter, it will cut like Wax, and it should especially be well wrought with the Hands, when it is fresh taken from the Churn and salted for common use; for if the Milk be not well work'd out of it, the Butter will not keep. With respect to the prices of butter, it appears by the household-book of Lord North that a pound of butter in the reign of Queen Elizabeth cost fourpence: at the present time [the summer of 1835], a pound of the best butter in the west of England costs from sevenpence to eightpence, while in the metropolis the price is fourteenpence. After the cream had formed lumps of butter, it still wasn't ready for serving or preserving. It was taken out of the churn, probably with wooden scoops, ready to be refined, salted and shaped. All the buttermilk separated from the butterfat had to be rinsed out. This would improve texture and flavour, and also help the butter keep well, since milk turns rancid more quickly than fat alone. Salt was usually mixed in at this stage - for flavour and preservation. The rinsing could be done simply by washing in water, followed by draining, salting and working or "kneading" the butter with a pair of wooden butter hands, (see right), or with bare hands. Until the 19th century working the butter with your hands was the norm. The wooden bowl (left) was used by Yorkshire butter-makers to hold the butter while they "clashed" it - prepared it by hand. In the 19th century the butter worker - a wooden tray with roller - was invented to help with these processes. In Wales butter working was done with a circular wooden tool in a round bowl like an open shallow barrel. In grocers' shops in Britain the "hands" were used well into the 20th century to cut a piece of butter from a large block, on request from a customer. In the kitchen they were used to make individual butter balls for serving at table - just roll a small lump around between the two wooden pats. In England butter might be formed into various shapes. This 18th century stamp was designed to keep a rounded top on a lump of butter. During the 19th century half-pound bricks became a standard shape, even though bulk buyers bought barrels or large blocks. Patterns, stamped or cut, might mark the original source. The patterns varied by region - with cross designs associated with the north-west and thistles with Yorkshire. In the US both pounds and half-pounds of butter were common, sometimes wrapped in good quality dairy cloths, not just in thin butter muslin/cheeseloth. Bog butter is famously ancient butter found buried in centuries-old layers of Irish peat, in wooden containers. Although archaeologists aren't sure of the reasons it was buried, it shows that the people who made it knew it must be packed away from contact with air, and kept cool. Butter storage presents different problems in different climates, but whatever the temperature, its surface must be covered - packed into barrels or crocks, or wrapped in leaves or paper. Water or brine may be used to form an air-tight seal at the same time as helping to keep it cool. This was sometimes called pickling the butter. Really hot countries where butter is made in quantity, like India, use clarified butter (ghee), with the last traces of water and milk solids removed to help preservation. When English-speaking migrants (and other northern Europeans) arrived in warmer countries they resorted to keeping butter down a well, or in elaborate coolers with cold water reservoirs and draped cloths. Unglazed earthenware dishes and covers were useful as they would soak up cold water. Coolers with bell-shaped domed lids were in use long before the recent popularity of "butter bells" in the USA. (Above right) These are often not bell-shaped at all, and are just like the French butter dish or French butter crock - based on a 19th century design from France, but barely known there now. The old priorities have changed in an age of huge refrigerators, and "French" butter crocks are now desirable for keeping butter spreadable, neither too cold nor too warm. Back in Britain, cooling was a slight problem in summer, but more urgent if butter had to sit for hours in a warm dining room. Butter cooler there often meant a handsome silver dish for the table, resting on a compartment filled with water or possibly ice. Decorative silver butter coolers were well-known in 19th and early 20th century North America, where "table rituals involving the consumption of butter" (pdf) became important. American coolers held an array of small portions destined for the individual dishes known as butter pats. 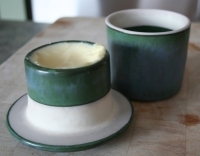 These ceramic pats, which are now very popular with collectors in the US, were not used in the UK, where butter pat always means either a small lump of butter, or a spatula/paddle used for handling butter. Pats, curls, rolls, and butter shaped by stamping were served in well-to-do Victorian homes in Britain. The most elaborate butter "models" were created with two-piece wooden moulds. Tibet had traditional churning songs, and so did most butter-making cultures. Variations of "Come, butter, come" are the best-known in English, by far.